President Felipe Calderon on Thursday rejected U.S. concerns that Mexico is losing control of its territory to drug cartels. In an interview with The Associated Press, Calderon said his government has not "lost any part  any single part  of the Mexican territory" to organized crime. He also called "absolutely false" the idea that Mexico is in danger of becoming a failed state if the violence continues. That concern has been a major topic of discussion in Mexico and along the U.S. border since the U.S. military first raised it in November. The Pentagon report on potential future threats singled out Mexico and Pakistan as countries where state control is at risk. Meanwhile, Mexico's federal attorney general said Thursday that more than 1,000 people have been killed in the first eight weeks of this year, but he believes the drug violence is reaching its peak. In an interview with The Associated Press, Attorney General Eduardo Medina Mora also said that 6,290 people were killed last year in drug violence - the most specific accounting yet of killings that doubled the 2007 toll. Medina Mora said the world's most powerful drug cartels are "melting down" as they engage in turf wars and fight off a nationwide government crackdown. The government doesn't expect to stop drug trafficking, but hopes to make it so difficult that smugglers no longer use Mexico as their conduit to the United States, he said: "We want to raise the opportunity cost of our country as a route of choice." He applauded cross-border efforts to arrest more than 700 Sinaloa cartel members in the United States, but called for more U.S. prosecutions of people who sell weapons illegally to the cartels. He also would like more U.S. efforts to stop drug profits from flowing south to Mexico: Mexico has spent $6.5 billion over the last two years, on top of its normal public security budget, on the fight against drugs, but that falls short of the $10 billion Mexican drug gangs bring in annually, he said. 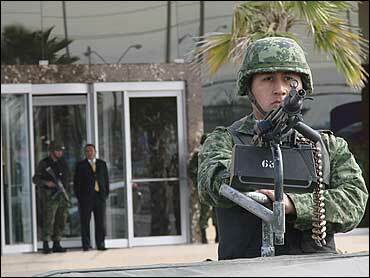 Mexico has no choice but to press ahead with its fight, he said, predicting that violence will ease. "I believe we are reaching the peak," he said, but added that the government won't achieve its objective "until Mexican citizens feel they have achieved tranquility." While violence in Tijuana is down sharply from last year, killings have spiked in the largest border city, Ciudad Juarez. The city of 1.3 million across from El Paso, Texas, is now the most worrisome of a number of hotspots, Medina Mora said. "But this is not reflecting the power of these groups," he said "It is reflecting how they are melting down." The attorney general's remarks come on the same day as Mexico announced it will deploy extra troops and federal police to Ciudad Juarez, across the border from Texas, where the police chief recently bowed to crime gang demands that he resign. Interior Secretary Fernando Gomez-Mont did not say how many more soldiers and police would be sent to Ciudad Juarez but promised that the reinforcements "would be visible to the residents." In a sign that Mexico's violence is reaching across the border, federal agents rounded up more than 750 suspects in a wide-ranging crackdown on Mexican drug cartels operating inside the United States on Wednesday. Some of the other numbers behind those arrests are staggering, reports CBS News correspondent Bill Whitaker. The DEA seized more than 23 tons of marijuana, cocaine, heroin and methamphetamines; plus dozens of planes, boats and cars; more than $63 million in cash; and scores of weapons in the operation.